The Most Resilient Trees in Oregon | Mr. Tree, Inc.
Portland, Oregon has a colorful past. Most towns do here in the West. Head back in time to the 1800s and you’d find a never ending sea of green all along the Willamette River. Trees were in abundance. Different ports were cleared through the trees to make way for sea-going vessels to come in and out for trade as a new city was being formed. And as these new cities formed, the trees disappeared. They were cleared away to make room for progress. Portland thrived, and the rest, as they say, is history. As humans, we learn from our mistakes. It didn’t take long for us to realize that trees are vital to our success. The original nickname of “Stumptown” wasn’t something we embraced, so we changed. We might embrace the nickname “Stumptown” today thanks to companies like Stumptown Coffee Roasters, but we’ve also learned the value of trees. We’ve had a collective shift away from the desire to clear away trees for progress and instead, invest in trees to become part of our environment. Trees are not just something to look at; they are vital to our very survival. Drought, climate change, landscape fragmentation, fire, disease, infestation, and past forest management practices have all shaped the surrounding areas. But tree services are learning. And they are changing the way they approach the life of a tree. To reduce tree mortality and increase tree health, a natural approach is always best. That’s easier in a forest where you can have a diverse mix of tree ages, open canopies, and other natural forest features. But it does apply to the trees you plant on your property as well. Resilience is built up by allowing yearly stresses to occur. Some years we’ll have a drought, while other years will produce record levels of rain. Trees adjust and grow and change accordingly. As a property owner, planting trees and introducing them back into what makes the Pacific Northwest is vital for our environment. But it’s not as simple as heading to your local big box store and selecting one from the thousands they bring in every year. Some trees are native. Some aren’t. And the best value you can bring to your property is to focus in on selecting a tree that is native to our area and will thrive no matter what the conditions. That’s where a tree service can help. As a tree service, we start by helping you select the right tree for your circumstances. Ever planted a tree too close to a structure on your property and had problems after a few years of growth? They may look small when they are only a few years old, but they quickly show their true colors and can take over most of the landscaping in your yard. Not only is selecting a tree a challenging process, but caring for it can be difficult too. Did you know there are better times to prune a tree than others? Did you know there are better times to fertilize your trees throughout the year? And while you can make just about any tree survive if you provide it with enough care, when you select a tree that is native to the Pacific Northwest, you are giving it an even better chance to thrive. Luckily, we have an array of native trees that will be a beautiful addition to your landscape. In fact, Oregon has a wide range of trees that can do the job quite nicely: 30 native coniferous species and 37 native species of broadleaf trees. Oregon varies greatly in elevation, temperature, wind, rainfall, and soil consumption. 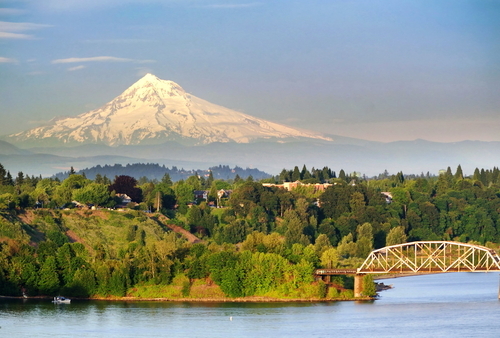 What works in the East won’t necessarily work in the Willamette Valley. If you’re looking for the perfect tree to add to your property, keep these trees in mind. The bigleaf maple has the largest leaf size of all the maples. You’ll find furniture, cabinets, flooring, and other manufacturing uses the bigleaf maple frequently. The sap of the bigleaf maple can be used for maple syrup production, though it’s not commercially. The bigleaf maple is a medium to large tree, growing up to 120 feet in height. It is shade tolerant and is usually interwoven with other hardwood trees. The bitter cherry tree is often mistaken for a shrub rather than a tree as it is a medium deciduous tree that grows up to 50 feet tall. Its leaves are oblong to oval, flowers are highly fragrant, and the bark is red to dark brown. It produces beautiful red fruit that is bitter to the taste. However, birds and small mammals will eat the fruit, so it’s a wonderful addition to your landscape if you enjoy wildlife. Few can dispute the beauty of the Douglas fir. This large, sun-loving conifer can grow more than 200 feet in height and is capable of living hundreds of years. Because of its stability and strength, it is one of the most popular trees used in architecture and the building industry. They are an important habitat for nesting birds. The Oregon ash is found throughout the Pacific Northwest’s interior valleys, along streams, and in wet areas. Its tolerance to standing water allows this tree to grow well in all kinds of areas where no other tree species will grow. The Pacific dogwood is best known for its beautiful white flowers. It is a shade tolerant large shrub or small deciduous tree that grows to around 30 feet in height. Orange or red berries replace the white flowers, providing food for birds and other small animals during fall and winter. They also put out a colorful display in the fall when the leaves turn a brilliant shade of red. The Western redcedar is prized for siding, shake roofs, and decking materials. It is an important conifer along streams where it provides woody debris for healthy stream structure. It is a medium to large shade tolerant tree that grows up to 150 feet in height. It likes moist ground and doesn’t need much sun. The leaves are a major food supply for big game including deer and elk. Want to ensure the trees in your landscaping are as beautiful as they are functional? Maybe it’s time to find a tree service that can provide you with the best value for caring for your trees for the long term. Give us a call today.